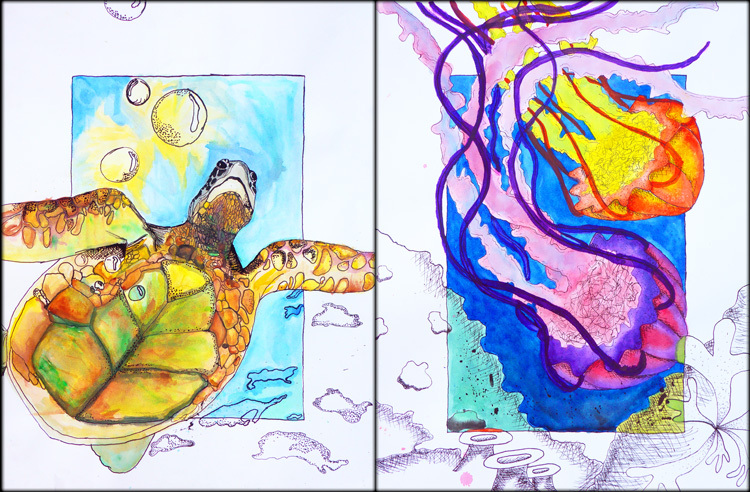 Kapaa Middle School Art students were inspired by a “Water Life” theme for this watercolor painting project. While exploring various watercolor techniques, students also learned about asymmetrically balanced composition and value created through texture. The idea for this lesson was inspired by a similar project titled “Beyond the Border,” posted by Art teacher Michelle East. Students used the Rule-Of-Thirds to place the focal point of their subject off-center. The main subject extends beyond the inner rectangle onto the border, which is left black and white. The final result is an illusion that part of the image is spilling over the white border that frames it. Watercolor techniques included wash, value-gradient, color-gradient, glazing, wet-in-wet, salt, isopropyl, splatter, and blowing with a straw. Students practiced the techniques by making a bookmark with all of the techniques labeled for reference. Finally, crosshatching and stippling were applied with a calligraphy stylus (the kind you dip into an ink-well) to create depth and shadow. Black ink outlines were also added to all contours as well as the defining edge of the frame. 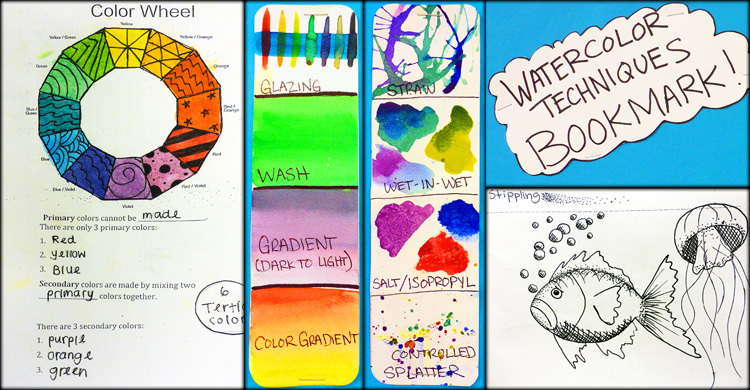 Pictured below are some of the sketchbook activities that went along with this lesson. These turned out just great! I love the boarders, the colors and the asymmetry. The artists should all be very pleased with their work–and their teacher’s guidance!!! These turned out SO BEAUTIFUL!! I know you are proud of your students! I’m so glad you were able to use the lesson-that’s what is there for-to inspire others to create. Hope you’re having a great school year! 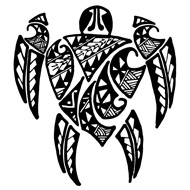 Aloha…my name is Ragen Carpenter. Currently, I live in Tampa Florida and teach middle school 2D/3D to students at Burns Middle School. Several years ago, I worked at Chiefess Kamakahele’i In Lihue. I lived over on the dry side in Waimea…loved it but I was a temporary hire. Anyway…I was hoping to get your lesson plan for your watercolor experience. They look amazing and I still need to incorporate watercolor techniques into my curriculum. If you would send a copy to me I would be very appreciative! I would email you pics. from my art studio/students. Thank you for your message… what a small world it is! To be honest, I don’t really write lesson plans anymore. It works best for me when I have the general idea and standards in mind, and then unfold the lesson for my students step-by-step as I assess what instruction they need for each step. Make sure to follow the links that I posted with the assignment Rubric and Self-Evaluation worksheet for more specifics. I also linked to Michelle East’s website, which was my inspiration for the assignment. She provides more details that might help you out. This project caught my eye because I like the paintings of animals. This would be a perfect and amazing project to do this year. In Art class I also want to learn how to do clay, paintings, sketches, and even posters to decorate for special occasions. No, the images were not traced. Students researched their subject before practicing thumbnail sketches in their sketch books. After working out a small version, they lightly drew with pencil on the larger watercolor paper before painting. I wish I could have all my students congratulate you on creating this wonderful project! I did a recreation of this with my 5th grade students and they adored this project! So much love and respect from Michigan! Great project!! Did you have a pile of magazines in your classroom so the students could do their research? I imagine they all had a color reference? I’m wondering if I could take them all into a computer room and have them draw from an image they find on the internet? Did any of your students use a grid to help them draw? Thank you!